Navy SEALs launch a rescue mission after terrorists plunge a jet carrying a missile-launching computer into the sea. A Top Secret Nuclear Facility. And The Enemy Is Inside. Well this was a good laugh. The only problem it wasn't a comedy & was so trying to take itself seriously. 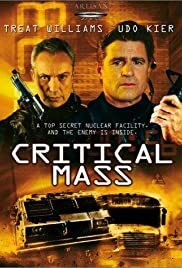 The acting in the film is appalling, with Treat Williams (A good B actor at the best of times) walking through the film in a trance, & he wasn't even one of the worst in it. There was the usual stock women characters ( a bossy reporter with gleaming fangs) who was extremely irritating, & a leggy blonde in the tightest mini skirt who was laughably in the government & spent most of her time looking serious. I wont go into the plot, as it was extremely boring & laughable, & I certainly wouldn't want to destroy any enjoyment for anyone who wants to waste 90 minutes of their life.